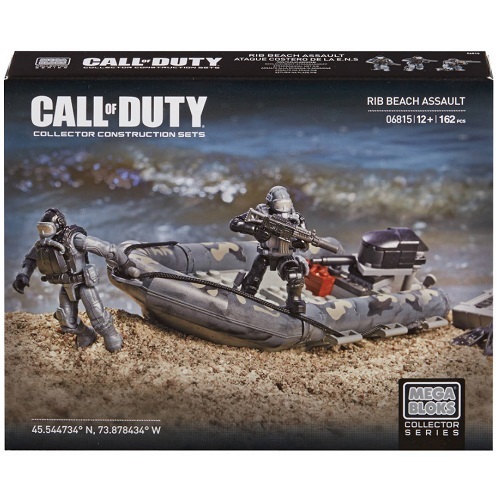 MBCOD: The Mega Bloks Call of Duty Set 6815 RIB Beach Assault [Watercraft Seals Harbor Attack COD] contains flippers- and might those re-breathers? Two M.A.F., accessories and a buildable combat raiding craft should make this set a winner! Derek, Frost, Westbrook, and one other super poseable micro action figure are possibly included. Includes 16 highly detailed, interchangeable accessories and weapons like removable combat vests, ammo pouch, boots and flippers, combat knives, and more! The combat raiding craft of the RIB Beach Assault is used for clandestine insertion of military personnel on beaches, piers and offshore facilities. The RIB Beach Assault's buildable raiding craft comes with a rotating outboard engine, realistic righting lines and hand-grips, and measures 7.25L x 4W x 1.5H in inches. Derek ?Frost? Westbrook and his special ops rifleman possess extreme poseability for any combat scenario, and highly detailed, authentic interchangeable accessories and weapons that allow for mission-specific customization.